Two weeks ago, I wrote about Staples’ current offer of a $100 prepaid card for students buying select laptops, which has since become the most popular post on this blog. As I argued on that post, despite all the hype, I don’t think it’s such a great deal, particularly since the offer is limited to 4 laptop models. But here’s a similar offer that might be worth getting excited about if you’re already Mac fan: Apple is giving a $100 Apple gift card to any student who buys a Mac (except for the Mini) by September 20, 2011. The downside of this promotion as compared to the Staples’ one is that you get the reward as an Apple gift card, which can only be redeemed on the Mac App Store, the iTunes Stores, and the iBookstore, while the Staples deal offers a Visa prepaid card, which can be used anywhere. On the other hand, Apple’s offer applies to all new iMacs, MacBook Pros, MacBook Airs, and Mac Pros – both laptops and desktops – while Staples’ deal is much more limited. 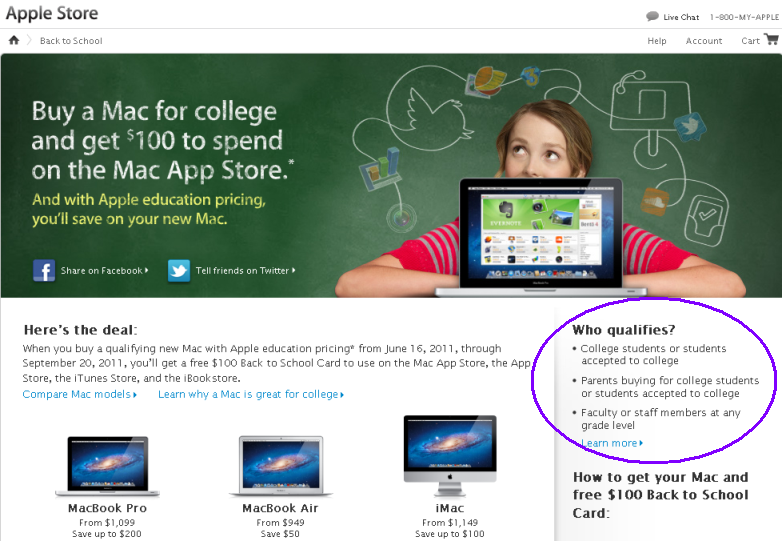 a screenshot of Apple's deal: Who qualifies? You might! Then again, even the cheapest Mac is more expensive than any of the laptops that qualify for the Staples offer. But let’s be honest: if you’re an Apple fan, you’re likely not in it for the money. So if you’re going big anyway, you might as well get the $100 gift card with your purchase. To qualify for the gift card, you must use the Education Pricing discount that Apple usually offers to college students, parents, and faculty, which means you’ll get the discount plus the $100 card. To get the deal, you can buy your new computer online through the Apple Education Store, at an Apple store, or at your campus store. If you buy your new computer through one of the first two, the gift card will come with your purchase. If you buy on campus, just visit www.apple.com/promo within 90 days of your purchase to claim your gift card. There’s a limit of 2 gift cards per person during this promotion. While Macs are definitely not the cheapest computers out there, I’m highlighting this offer in Money Under Your Futon because this blog isn’t just about saving; it’s about finding ways to save so you can live in style. If you’re a Mac fan, you clearly care about style. And if you’re eligible for this offer, you need all the deals you can get. While I was watching TV the other day, a Staples commercial advertising a $100 prepaid Visa card to students buying specific laptops caught my attention. Qualifying for the rebate card is fairly easy, as you only have to show a valid student I.D. or acceptance letter, and the prepaid card will be mailed to you eventually. This seemed to me like a great deal at first, so I decided to check out the eligible computers. There are only 4 models eligible for the prepaid card promotion, though to Staples’ credit they all come from different manufacturers – Dell, HP, Samsung, and Toshiba – and are of different sizes, giving buyers some options. However, they are all at least $579 without the rebate. I am not a computer expert and I can’t evaluate the specifications of each of the models in this promotion, but I think that while $499 (including the rebate) isn’t bad at all for a laptop, it doesn’t qualify as an amazing deal unless you are looking for exactly one of these 4 laptops. Even Staples is selling some other laptops for less than that, and I’m guessing most people don’t need more than a simple laptop for school or post-school work. Along the same lines, Dell is offering $100 off its XPS 15 and XPS 17 laptops (promo code 932N$0ZCCHWZB9, sent to my inbox). These, however, are fairly advanced laptops with 3D capabilities and HD screens, starting at $799 without the discount. Chances are that, unless you work with graphics or are a computer aficionado, if you’re looking to save money these are probably not the computers for you – as enticing as a $100 discount may seem. With all the back-to-school deals around, flexibility will likely save you more money than a $100 prepaid card or discount on these select laptops ever could. That said, if you’ve been eyeing any of the 4 laptops eligible for the Staples prepaid card, or Dell’s XPS series, this may be a good time to buy. Neither promotion has a published expiration date, but acting soon is probably better. And if you do make a trip to Staples to check out their laptops, here’s another published offer that’s actually a good deal, albeit less flashy: 300 free printed labels with the coupon linked here. This could be useful for labeling your own stuff (including your new laptop! ), or for making return address labels for job applications, thank you letters, and “please send money” requests sent to family. The terms and conditions for this offer seem to have been hastily written, and the exact timeframe in which the card will be mailed is unclear. Per the T&C: “Visa prepaid card will be mailed 15 days 4 to 6 weeks after submission of easy rebate.” Also, the webpage listed on the Staples website for the easy rebate redemption, http://www.StaplesEasyRebate.com, is incorrect and leads nowhere; the correct page is www.StaplesEasyRebates.com (with an “s” in the end).